And it doesn’t look as if he’s going to stop there. Already compared by some to Jo Nesbø, his novel is a bestseller in Denmark and Norway, has been sold to over 15 countries, with the movie rights to the planned series of six novels purchased, too. In addition, he has scripted a number of films, written for the theatre and penned a suspense novel for children. 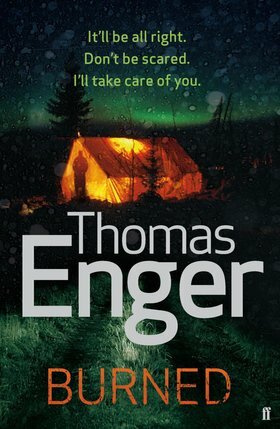 With that kind of pedigree, it is no surprise that Thomas Enger is now considered to be the most prominent of Norwegian writers. Your story is set in Oslo. For the many readers who have never been there, does it have a darker underbelly than the tourist brochures might allow? I believe that to be the case with most cities around the world. No tourist brochure will ever tell the whole story about a city, and that would also be a huge mistake. People will travel elsewhere. But Oslo is a city like any other. We certainly have our fair share of crime, but it is really a nice city, especially if you stay away from the tourist traps and discover what Oslo is really about. Give us a run-through of the basic story – a sort of elevator-pitch, if you will. Two years after crime reporter Henning Juul lost his son in a domestic fire, he returns to work with deep scars, both physical and mental. On the very same day a woman is found dead in a tent. She is half buried in the ground, and she has been stoned to death. This becomes Henning's first case, and he slowly gets back into the groove, so to speak. He discovers that the truth is a lot more complex than everybody would like to think. And that puts even his own life in danger. Did the character of Henning Juul come fully formed or develop over a period of time? Once I had the basics of the character, with Henning being a crime reporter with deep scars and a strong motivation, the bits and pieces of him quickly fell into place. I knew I was onto something, and I also discovered that this character was so interesting to me that I wanted to write more stories with him as my main protagonist. That's how the idea for the whole series started, and I spent about six months building a platform for him and the characters around him before I wrote a single word. Henning Juul wizzes around Oslo on a Vespa. Were – or are you – a secret Vespa owner? I have never driven a Vespa in my life. I would really like to, though. Especially now. The police in Burned don’t have the snarling presence of many fictional cops. Does this reflect well on the real police in Oslo or do we have some surprises in store? Policemen or women are human beings like any other. They have the same flaws as most people, although we would like to believe that they are these super creatures that are never tempted to do anything wrong. I want my characters to be as real as is humanly possible. Whether there will be more surprises in store, you will just have to wait and see. Burned touches on the impact of new cultures and specifically, Islam on Norwegian society – although this isn’t the main theme. Will such references form the backdrop for future writing, scratching the itch of local issues? I don't have any agendas to what I'm writing. The characters and the plots will always come first, but if I at the same time can say something about modern society that hopefully will give the readers some new insights, then I certainly won't let that opportunity slip through my fingers. Why crime writing? What started you on that road? When I grew up, my parents always wanted me to read the classics. Although I found them interesting, I discovered that I read crime novels in a completely different fashion. I simply devoured them. And when I started to write myself, crime was the obvious choice. Who do you read and what, if any, are your influences? I try to read as much as I can as often as I can. Because I am a crime writer myself, eight out of ten books I read are probably crime novels, mostly because I love to read crime stories, but also because I want to stay up to date on what my contemporaries are doing. My biggest influence when I started out was probably Henning Mankell. Nowadays I am completely blown away by the talent of Harlan Coben. He is such an amazing writer. You have scripted several short stories as films. What films - if any - influence your work? I watch a lot of movies and series on TV. Movies like Silence of the Lambs, Seven and Heat are movies I can watch over and over again. Last summer I watched the whole Sopranos series (86 episodes). I was so impressed by the complexity of the characters, all of them, and it has really been an inspiration for me. I love to create huge universes with a lot of full-bodied characters. You use Oslo as the location of your story. Would the readers be able to follow the trail around the city – say doing ‘Henning Juul’ tours? I actually just did a tour with four journalists from Germany, Austria and Switzerland. I showed them Henning's streets, where he watches football, where he works, where he lives and breathes. It's a bit strange, actually, to walk the streets of an imaginary person, although Henning feels very much alive to me. As a former journalist (on online newspaper Nettavisen), you are clearly accustomed to research. But do you find yourself using a different ‘eye’ to gain material for fiction rather than for news? The processes are somewhat the same. I do a lot of interviews, I visit places with my camera, and I terrorise my sources with questions. Just like a normal journalist. But there are so many details that need to be sorted out when you're writing a novel, and a reporter often just thinks about the bigger picture, the headline, what the story is, how you can trigger the reader into actually reading what you are reporting. As an author I can devote a whole day of research to figuring out what it smells like in an ambulance or what kind of techniques work best if you want to sharpen a knife. Do you enjoy writing more about heroes or villains? It's a lot more fun to delve into the minds of people who have crossed the lines of what is accepted as normal behaviour in today's society. Something has made them that way, and it's interesting to try to describe how they think, what they do and why. I have to be them, if only in my mind. At the centre of Burned is an undercurrent, the remnants of family relationships at extreme odds. Do you find that is something which draws you? Family is the core foundation for any human being, and I am quite fascinated and impressed by people who manage to keep going, to pick up the pieces of their lives, even after experiencing the worst things imaginable. And I thought to myself, before the idea of this series came to me; what's the worst thing that could happen to me? The answer to that question was easy. I have kids. Just the thought of losing them really makes my heart ache. But like I said, I am somewhat drawn to people or characters that somehow carry on. And that's how Henning came to me. I gave him a reason to keep on living. Will you keep your plots ‘local’ or will you move to even more exotic locations (Oslo being, of course, extremely exotic, as the tourist board will no doubt point out). Every novel will stand on its own feet, and there will be different characters in all of them. Not every character is from Oslo, and not every scene will be played out in our capital. In my second novel, Pierced, quite a large part of the story takes place in the middle of Norway. You are also a composer. Does the composition of music share anything with the creation of a novel, or are they worlds apart? Writing music is a lot more instinctive for me. I usually just let my fingers find their own paths on the piano, and when they discover something interesting or beautiful, I grab hold of it and develop it. I have to work a lot harder to create something readable than something worth listening to. But I love both processes. Are you a push-with-the-nose sort of writer or a planner? 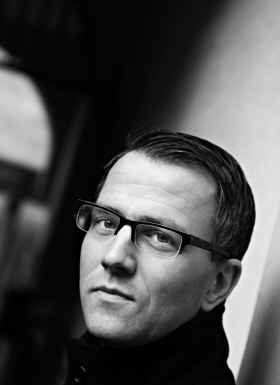 I spent six months planning the whole series of Henning Juul, and I wrote the first novel quite quickly because my preparations for the first one were excellent. That was not the case with the second. It took me longer to finish, and that taught me something. I have to plan in greater detail before I start the actual writing, and that's what I am doing this third time around. I feel like there is still so much for me to learn when it comes to the craft that is story telling. How has your family reacted to your writing success? They are thrilled, of course, because they know how many blows I have received over the years. And that makes this success taste even better. You've read the interview so what did Adrian Magson think of the book? Click here for the review.